Forget about the gourmet restaurants. 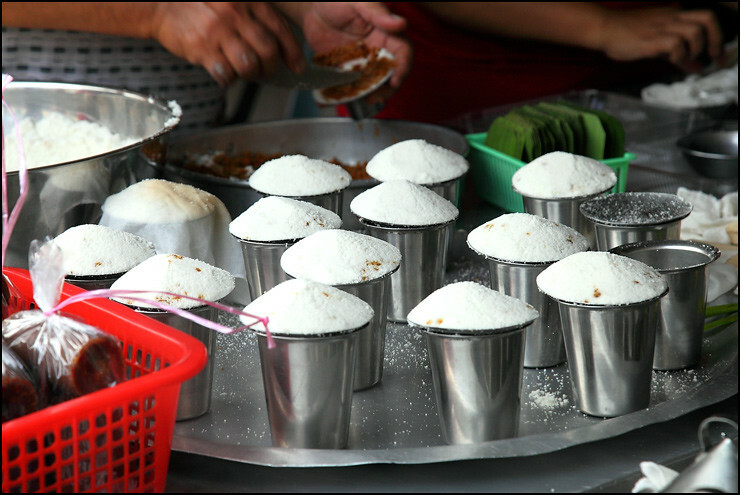 Sometimes all it takes is a simple yet delicious snack such as Putu Piring to make your day. 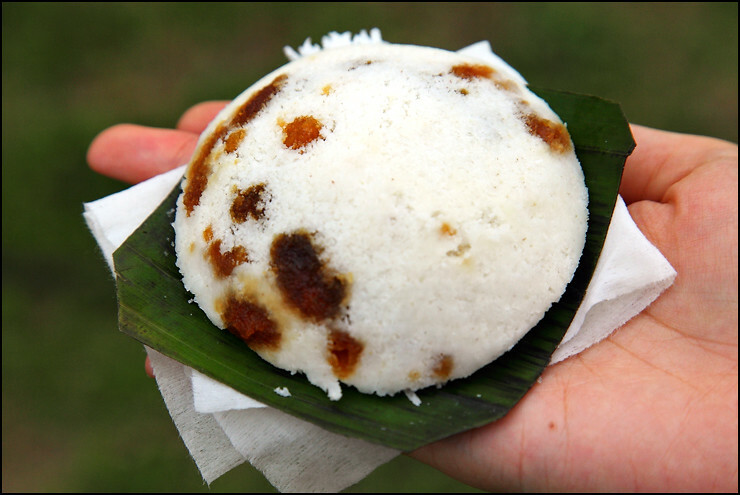 This humble rice cake is the one of the three ‘putus’ (the other two being putu mayam and putu buluh) that are easily available at your nearest pasar malam. 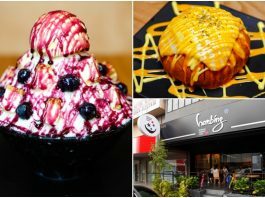 It is especially popular during the Ramadhan season where they are selling like hot cakes literally at the Ramadhan bazaars. If you happen to drop by Melaka and is already sick of the many touristy food that require lining up under the hot sun, this putu piring stall at Jalan Tengkera could provide a more pleasant experience. The middle-aged couple just manage to make them tastier. Equipped with only a steamer and a table, their stall’s setup is as simple as it gets. Not surprsing, since putu piring is a cheap and fast to make delicacy. 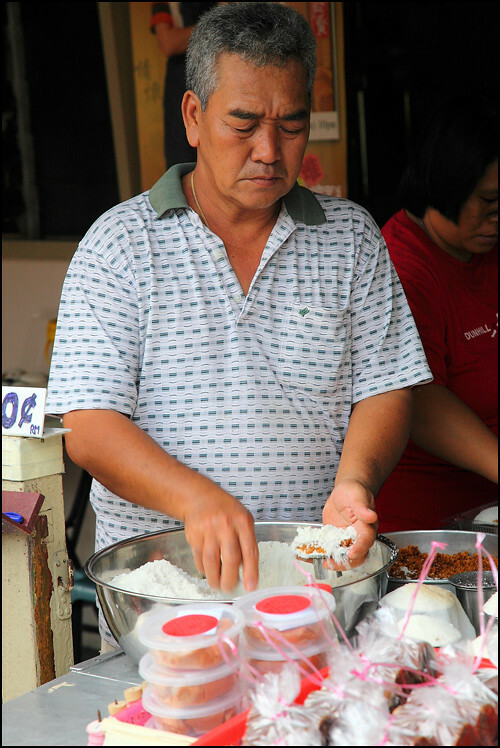 Firstly, the uncle fills up the metal dishes with rice flour and palm sugar (Gula Melaka) into a small piece of cloth. 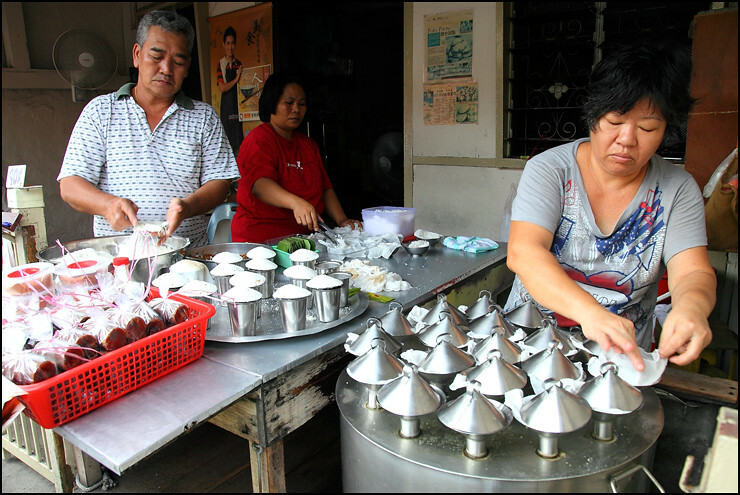 Then he cups the pre-steamed cake with his hands tightly which creates the ‘piring’ shape. Looking at the rate he was going, it is obvious that he already knows the measurements by heart. These are just waiting to go on to the steamer. Just opposite him is his wife who is responsible for steaming the cakes. 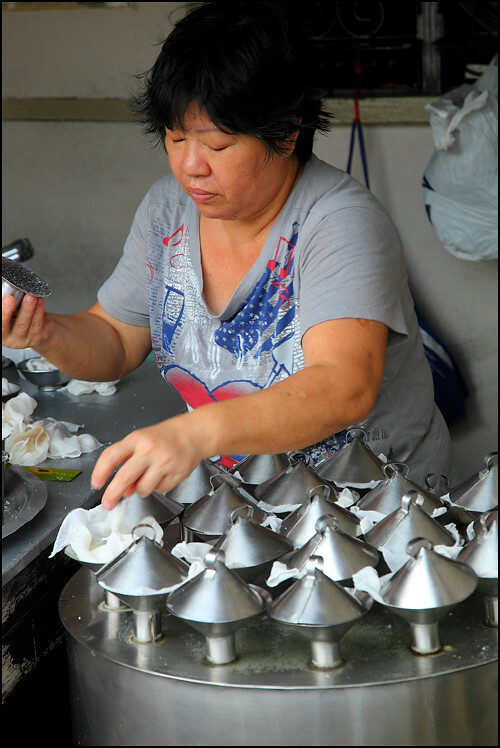 She checks on the putu piring by quickly flipping the dishes and that makes a lot of rhythmic, clapping sounds. Once they are cooked, she would transfer them to be cooled down on a piece of square banana leaf that is also laced with shredded young coconut. The best time to enjoy the putu piring is while they are still warm and fluffy. And we actually finished all five pieces we bought by the road side immediately after buying them! Price wise, even though they seem slightly more expensive than the rest @ 90 cents each, it is worth it because of they are quite generous with the Gula Melaka. Each bite is so satisyingly delicious and comforting. 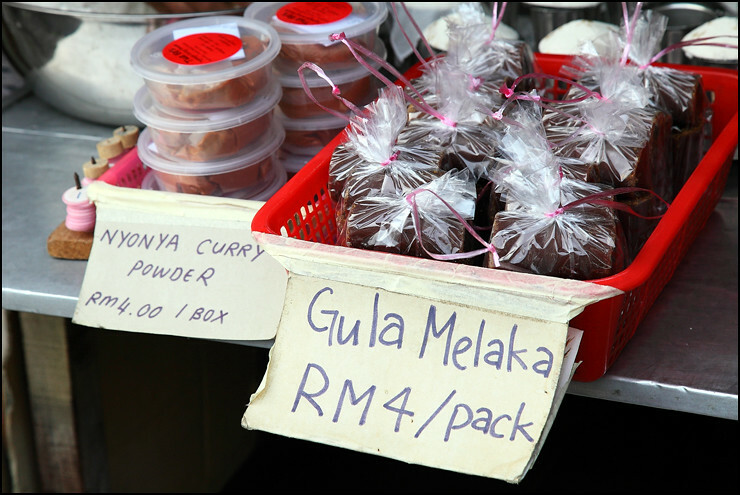 Besides putu piring they also sell pre-packed Gula Melaka and Nyonya Curry Powder at an affordable price. These could make nice local souvenirs. If you didn’t know yet, there is also a nice mee goreng stall along Jalan Tengkera that is worth trying as well. 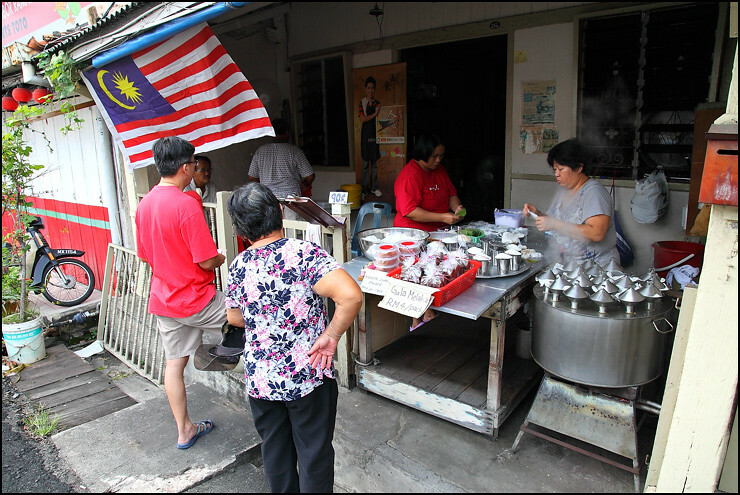 It is located just a minute’s drive further from this putu piring stall and opens in the morning only.